Here we are yet again… Whether you are a lover of the kitschy holiday or hate it more than anything, we cannot deny the power of Valentine’s Day (let’s call it V-Day from now on.) Relationships have been won & lost with this little day in February. 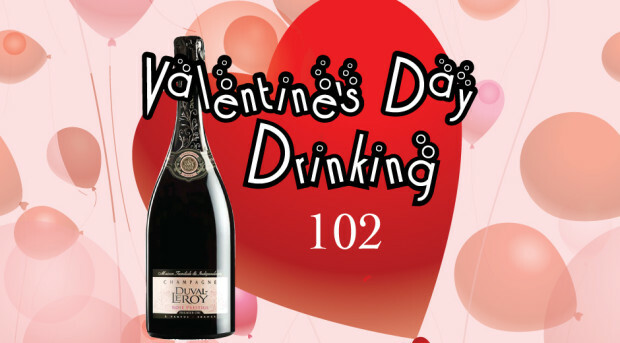 I, your drinking Sherpa, am here to ensure you don’t fall into the pratfalls of V-Day with one simple rule: BUY BUBBLES! That’s right; sparkling wine is your savior for this night. V-Day boils down to a few simple alternatives & for each there is a brilliant way to go. Scenario one, is all about you crazy kids going out to dinner. There’s the inflated ‘Prix Fix’ dinner. Check. Eighteen-dollar cocktails. Check. Pretending to be stuffed on spoonful of dessert… yes that too. After that there isn’t too much extra money to go around after that. This is the precise reason that a split of champagne at home after dinner is the way to go. Splits are half bottles. They’ll get you almost 3 full flutes of wine which is just enough for a nice V-Day toast before kicking off the shoes and crawling into bed. In this scenario there is no food, or much of anything except the two of you & those glasses. That’s when a rosé would be a perfect choice. Duval Leroy is the way to go. Sourced from top tier vineyards & produced to have a rich biscuit-like texture. You’ll get dark fruit like cherries or raspberries on the beginning of the palate transitioning into a finish that is all about citrus. For me, Meyer lemon really comes through making my mouth water and reaching for another sip. Next we have scenario two. This scenario seems to have become the go to for those comfortably situated in a relationship, which is to do pretty much nothing. Why I applaud you in concept but we can class up your Netflix and chill just a wee bit. You didn’t burn oodles of money or have any other drinks like in scenario one, so let’s get a full size bottle. V-Day is a perfect opportunity to show off a little by investing in something special. 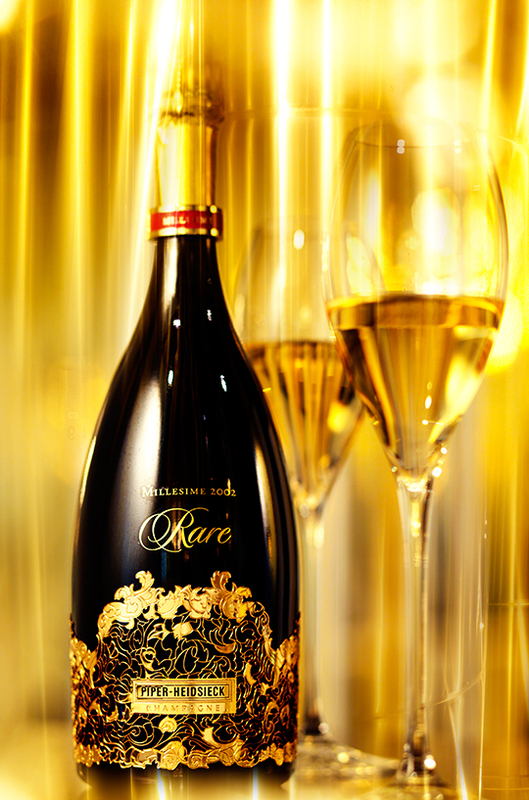 I am all about Piper-Heidsieck rare ’02 vintage. This bottle clocks in at about $190. It has all the things I loved about scenario one’s rosé, but has this unbelievable depth that can only come from champagne that is so old & so well made. This joyous combination of toast, dark fruit, & citrus might be my favorite way to splurge. If Piper-Heidsieck sounds like a way you would want to spend your V-Day, but the price tag scares you please remember that you are better than burned microwave popcorn. I know you are. Now, if you are single, depending on your worldview, the final scenario is one of either dread, or total liberation. On the upside, being single means that when it’s not V-Day, no one telling you to put the toilet seat down, or inquiring as to why you have five different types of shampoo in the shower. Yay! Shine on you crazy diamond. However, on the downside, this holiday can leave the romantic-types feeling a tad lonely and depressed. If that’s you; the solution is simple; bubbles again! Now I say bubbles & not champagne because I might not spend fifty, a hundred, or two hundred dollars to commemorate rolling solo. I will happily spend twenty bucks. This is where Cava comes in. All Cava is made in Spain, in Catalonia, the area around Madrid. Made traditionally with indigenous Spanish grapes, Cava tastes simply delightful. The best producer of Cava I know of is Raventós i Blanc. Raventós produces a bottle named L’Hereu that might be the best value in sparkling wine there is. L’Hereu 2013 has a gentler approach to citrus than their French counterpart. Cava uses more grapes in the blending of the wine than champagne; this creates a really nice change of pace and what can only be described as a uniquely creamy texture – one that provides hints of white peach towards the finish, which blend in rather elegantly. On this V-Day or any day, as your sipping this wine remember the most important thing about drinking bubbles alone. No one has ever cried into a flute of champagne. Ever.